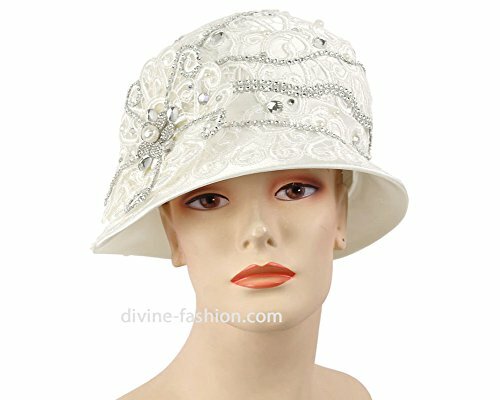 Women's Hats, Church Hat, Dressy Formal Hats #H879 (White) by Ms. Divine Collections at Laurenee Lifestyle. Hurry! Limited time offer. Offer valid only while supplies last. Year-round (buckram) hat. Asymmetrical brim and crown. Covered with satin and with embroidery lace layer. Topped with lace layered horsehair bow. Trimmed with metallic band, rhinestones and pearl studs. Pearl and rhinestone brooch accents. Crown size 22" / Crown Height L: 3 1/2", R: 5" / Brim width L: 3", R: 1 1/2" / Brim to brim 11"
If you have any questions about this product by Ms. Divine Collections, contact us by completing and submitting the form below. If you are looking for a specif part number, please include it with your message.